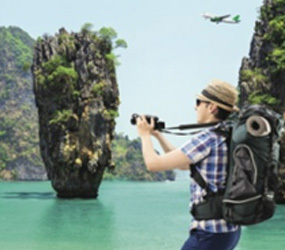 Travel Insurance - Choose the one that’s right for you. No matter where you go, you can go with ease just by having the best coverage from us. The Travel Insurance Plus plan provides coverage in case of illnesses, accidents during your travels all across the globe, whether for business or pleasure. Furthermore, we also provide you with the coverage that covers late arrivals of luggage or damage to luggage, even flight cancellations. We have a wide range of plans that will cover both yearly and per trip with compensation up to 5,000,000 THB. Frequent travelers and businessmen that travel to foreign countries often. We don’t have an age limitation on this plan so you can always be confident to travel anywhere in the world with the best coverage for illnesses and accidents with us. We have a wide selection of plans that suit your needs, whether per trip or yearly, they all have different coverage plans. Take a look at the table below for more details. * อ.บ. 1 หมายถึงการเสียชีวิต การสูญเสียอวัยวะ สายตา หรือทุพพลภาพสิ้นเชิงจากอุบัติเหตุ/ Loss of life dismemberment,loss of sight or total permanent disability. ** ข้อ 2.1, *** ข้อ 2.2 บริษัทจะจ่ายค่าใช้จ่ายสำหรับการรักษาพยาบาลที่ได้เกิดขึ้นในระยะเวลา 7 วันแรกนับจากเดินทางกลับถึงประเทศไทย / 2.1,2.2 The company shall pay such costs incurred within 7 days of the return to Thailand. Coverage for all medical expenses from illnesses and accidents up to 5,000,000 THB. No need to pay first, we’ll take care of it. Can receive medical care from both private and public healthcare providers. Coverage for continuous treatment in Thailand for up to 5,000,000 THB. Compensation for loss of income up to 3,000 THB. Coverage for dental care in terms of pain relieve during your travel up to 16,000 THB. In case of theft, we provide a cash loan up to 25,000 THB. No age limit to this plan. *อ.บ. 1 หมายถึงการเสียชีวิต การสูญเสียอวัยวะ สายตา หรือทุพพลภาพถาวรสิ้นเชิงจากอุบัติเหตุ / Loss of life, dismemberment, loss of sight or total permanent disability. ทำไมต้องใช้ประกันเดินทางต่างประเทศ พลัส เปิด-ปิด แตกต่างจากประกันเดินทางต่างประเทศเดิมอย่างไร ? เอกสารหรือหลักฐานการทำประกันเดินทางต่างประเทศ พลัส เปิด-ปิด และการชำระเงิน ?